"Kat has never lived a quiet life. She's an adventurer, a food writer who traveling the world visiting far-flung places and eating unusual things. Now she is about to embark on her biggest adventure yet - a relationship. She has fallen in love with an Italian man and is moving to... read full description below. "Kat has never lived a quiet life. She's an adventurer, a food writer who traveling the world visiting far-flung places and eating unusual things. Now she is about to embark on her biggest adventure yet - a relationship. 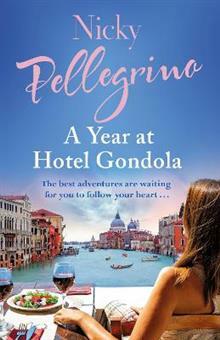 She has fallen in love with an Italian man and is moving to Venice to help him run his small guesthouse, Hotel Gondola. Kat will write all about her adventure: the food she eats, the recipes she collects, the people she meets, the man she doesn't really know all that well but is going to make a life with. But as Kat ought to know by now, the thing about adventures is they never go the way you expect them to"--Back cover.